If you’re interested in pursuing a franchise opportunity, there’s a lot of information you need to evaluate. One important area of information is the type of support that a franchise provides for marketing and other activities. As with most aspects of franchises, the type of marketing that a specific opportunity provides can range from excellent to non-existent. As someone looking into franchises in 2017, social media is one aspect of marketing that can’t be overlooked. We’re going to dive into exactly why that’s the case and then shed some light on the type of social media marketing support you should look for in a franchise. How Does Social Media Compare to Traditional Marketing? There are a number of different ways to compare social media to traditional marketing channels. A great starting point is how much it costs to reach one thousand people, which is a metric that’s often referred to a CPM. When you look at social media and three other methods of traditional marketing, the channel with the highest CPM is direct mail, which comes in with an average cost of $27. Magazines are next on the list with a $10 CPM, followed by billboards at $6 and social media with a CPM of less than $3. Those CPM statistics show that social media is far more cost-effective than any of the other three traditional marketing channels. But reach isn’t the only aspect of marketing that matters. Who a message is put in front of can matter just as much as how many people it ultimately reaches. Even with a much lower CPM rate, social media delivers a level of targeting that traditional marketing channels only wish they could offer. While magazines attract specific reader demographics and both direct mail and billboards can reach certain populations, the granularity offered by social platforms like Facebook is unparalleled. With Facebook’s advertising platform, both paid posts and boosted organic posts can be spread to tightly defined groups. Age, income brackets and specific interests are just a few of the targeting options that Facebook’s platform provides to businesses. While social media can move the needle for a franchise business in a very significant way, that doesn’t mean traditional marketing channels should be thrown to the side without any additional consideration. 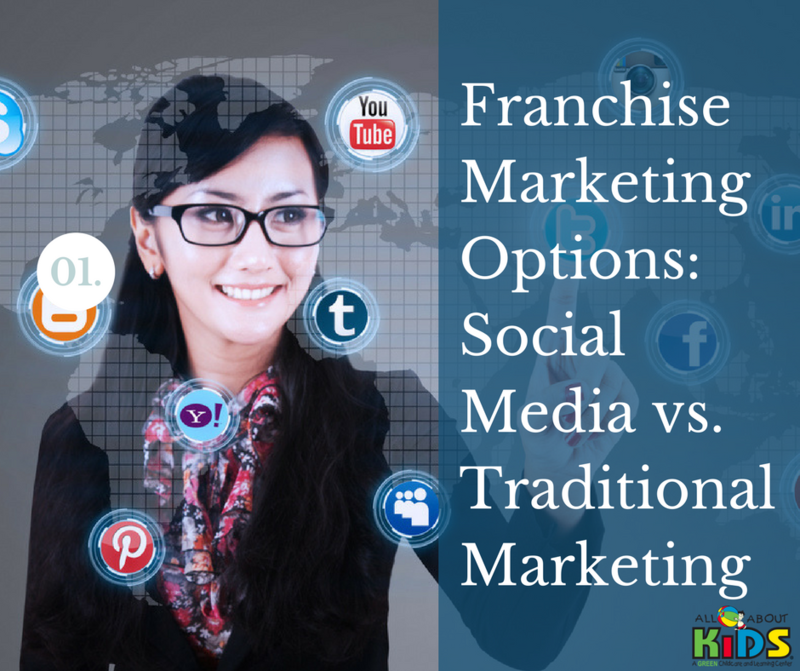 As you look into specific franchise opportunities, you’ll want to focus on franchises that take the initiative to try different kinds of marketing and then integrate the winners into a comprehensive marketing blueprint for owners. If you want to learn more about the marketing tools and support All About Kids provides to its franchise owners, simply head over to our child care franchise page for more information.